Overview : We offer reliable ticket service for a round-the-city tour along Guilin's Two Rivers and Four Lakes on this evening cruise. Two Rivers and Four Lakes is a circular water system, which weaves the major attractions at Guilin downtown into the travel route. Two Rivers are Li River and Peach Blossom River respectively, while Four Lakes refers to Shan Lake (Fir Lake), Rong Lake (Banyan Lake), Gui Lake (Osmanthus Lake) and Mulong Lake (Wooden Dragon Lake). The cruises are available at either daytime or night. Guilin Holiday recommends our clients to try the evening cruise, which is more interesting and rewarding, especially when the lights along the lakes are turned on, you will definitely be amazed by its beauty. Two rivers and four lakes evening cruise for 2 people, March 30th. Do you have English-speaking cruise available? 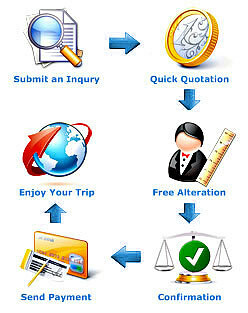 We are very pleased to be of service to you. 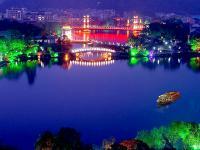 As to the night cruise in Guilin, our travel specialist will be in touch with you soon via email.